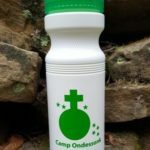 The Ondessonk Yowie Vacuum Travel Tumbler is perfect for camping trips or just adding a little camp spirit to your favorite beverage. 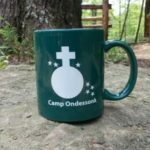 These travel mugs are made of durable stainless steel for long-lasting use. Dual-walled construction is designed to keep drinks hot or cold for hours. Unique tumbler features a wood grain pattern—perfect for outdoor enthusiasts, artisans and more.